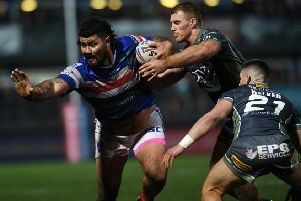 ON-SONG PROP Anthony England reckons Wakefield Trinity Wildcats can shock his former club Warrington Wolves this weekend. But he knows Wakefield will have to raise their standards to overcome the First Utility Super League leaders and take another step towards securing a place in the Super-8s. Wildcats, who were bottom of the table before Easter, began round 14 in seventh spot and are on a run of seven wins from their last eight league and cup games. They have a five-point gap over Hull KR, who are ninth and a shock victory at home to the current pace-setters would pile more pressure on the teams below them. England was man of the match in last Sunday’s Ladbrokes Challenge Cup victory over Toulouse Olympique, but admitted a repeat of that below-par performance will not be good enough in two days’ time. Looking ahead to this Sunday, the ex-Castleford Tigers and Featherstone Rovers front-rower predicted: “We will have to play better than we did last week. “It is going to be a tough game, they are a good team, they like to play fast and they have got some big middles, but we are confident we can beat anybody at home – or away for that matter. England knows Warrington’s coaching staff – which includes ex-Wakefield boss Richard Agar – will be wary of the trip to Belle Vue. Warrington have lost only three of their 13 Super League games so far this term, but one of those was away to second-bottom Huddersfield Giants last month and boss Tony Smith will be desperate to avoid a similar slip-up. “Having been coached by Tony, I know he won’t be taking it lightly,” England added. England joined Wildcats from Warrington in the off-season, but insisted he does not have a point to prove to his old coach and team-mates. “I approach every game like I am going to play my best,” he said. “Playing my old club doesn’t make any difference to me whatsoever. The same applies to Wildcats, who were given a fright by Kingstone Press League One Toulouse, after leading 22-0 inside 16 minutes. England said: “We gave Toulouse a lot of respect in the week, but we probably didn’t on the day and they took advantage of it and really gave us a good game. “It is hard when you go so far in front so early, but we are a professional side and we have to be better than that.